I recently found this website from the peace army and enrolled in their program. Overall I found it to be an extremely informative course. I struggled at some times to retain the information but after going back through it a few times I believe I have retained all the major points from the course and am now applying them to my trading. Thanks. I think the FPA has a great website here and a great resource to spotting scams from legit sites, however the unfortunate part as you identified is that anyone can review any product without confirmation from the company owner that they actually are a customer. Review Moderation Team Note: It's not a perfect system, but we do managed to filter out a large number of fake reviews, both positive and negative. There are people who want forex courses and systems for free. They will first buy and then ask for a refund. If you do not refund, they leave bad and negative feedbacks for you. Also there are some jealous guys or competitors who cannot withstand seeing 5 Stars. Even though they have not purchased your course, they will still leave negative feedback to drop your 5 Stars to 4 and then change their names and again leave negative feedbacks to drop your star rating to 3 and so on. Felix should look into this seriously. I know some clients will never be satisfied, and I am certainly unsure what Mr. Georges wants if he didn't even view the materials he purchased. I have received nothing but positive reviews on the course, and it is unfortunate that Mr. Georges feels this way about a course he did not even view. websites, you may find some of the materials in the course. If you really want to spend several hundred dollars on trading books and months searching trading websites for some of the same material, then by all means Mr. Georges I encourage you to do this. If you would rather spend just $97 to view a video course by a full time trader who put all of his concepts together in an easy to follow course with dozens of examples, then I encourage you to stop by my website. Trading requires a good amount of capital as well as even more responsibility, and if you are not willing to take the time to study the course and watch the videos then trading clearly is not the right profession for you. Anyone interested in viewing the details of Mr. George's case can view the following image which shows part of his IP address as well as how much of the course he has viewed. I am very dissatisfied with the quality of this product. This product is nothing more than a repeat of basic information that you can get reading a few books on the subject of technical analysis. You can also find the same information for free at babypips.com, elitetrader.com, and traderslaboratory.com. I personally think the purpose of the course is to get you to spend additional money on coaching. I wasted $97 on this product. Avoid at all cost. I did the 4 hour coaching session with Brendan. Really excellent at what he does. Service very good, also the coaching was really good practical and easy to absorb. 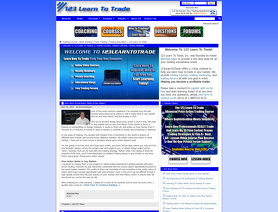 I would like to welcome you to 123LearnToTrade.com! We have a mission of not only helping people learn to trade and invest, but to allow them to be one step closer to the coveted state of financial freedom. We teach traders utilizing multiple teaching techniques--including through blogs, forums, videos, courses, one-on-one coaching, and more. I invite you to stop by our site, take a few moments to register, and start learning how to trade with us!